is honored on Panel 56E, Line 17 of the Vietnam Veterans Memorial. Today I thought of you as I have since your death on May 6 1968. I have immortalized you in two PBS docs that feature my work. If any of you who posted were in Vietnam with my brother, please contact me. 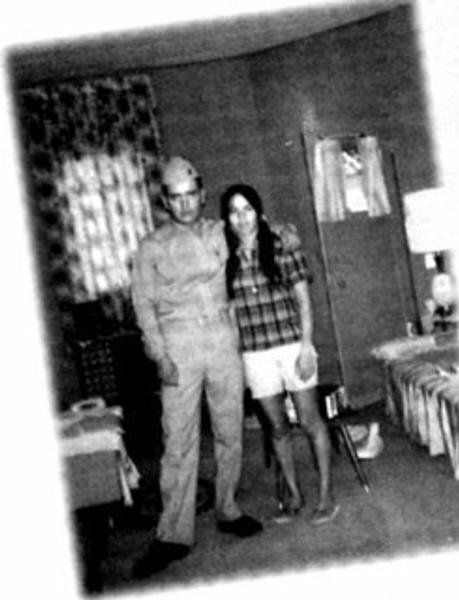 About the photo: Writer and former Johnstown resident Gloria Velásquez appears in one of the last pictures of her and her brother, John Robert “Fini” Velásquez, who was killed in 1968 in Vietnam...Velásquez is trying to establish a scholarship in her brother’s name for a minority student at Roosevelt High School. He remains forever just a kid. Frozen in the amber of grief over a life lost too soon. After nearly four decades, eyes now framed with wrinkles have to squint when they look back to recall when he was alive, but even today, tears still come when they do. But perhaps, his memory will help send another minority young man or woman off to college, rather than to war. Writer and former Johnstown resident Gloria Velásquez is trying to establish a scholarship at Roosevelt High School in memory of her brother, John Robert Velásquez, who was killed in the spring of 1968 in Vietnam. He was the first, and it is believed only, casualty from the community in that war. Velásquez, a noted Chicana writer and poet, and a professor of modern languages and literature at California Polytechnic State University in San Luis Obispo, Calif., started the scholarship a while back, but it hasn’t been awarded for several years. “I had started it, and then it sort of died out,” she said. “I tried to revive it last year, but it didn’t work out, so now I’m trying to get it going again faithfully every year. Velásquez wants the scholarship awarded to an African American or Latino/Chicano student at Roosevelt. Her brother dropped out of school in the seventh grade. He enlisted in the Marines when he was 17. His mother had to sign the papers to let him. In part, Velásquez believes, her brother chose to join the Marines because he felt the door to education was closed to him as a minority, and the military was a way out of the fields and the farm labor he had grown up doing. Her brother, 11 months older than her, was a smart young man, Velásquez said. A lot like their father. “My dad was the most intelligent man I ever knew, he loved to read, but he only made it to the seventh grade or so himself,” she said. “The majority of my uncles dropped out of school. I went on to eventually get my doctorate. Maybe there were different support systems for women and men. Maybe it’s the whole male, bread-winner thing. It’s still harder for men of color to make that leap to higher education. There are so many factors. About a dozen years older than his nephew, Molinar remembers pushing him around in a carriage when he was a baby – and partying with him when they were young men. “He lived a fast life. He lived the way he wanted to live, and he liked to party,” Molinar said. “Maybe he knew something; that he didn’t have a lot of time. When he came home on leave before he left for Vietnam, we went to Juarez together.” Molinar pauses for a moment. “We had a pretty good time,” he continues with a laugh, leaving it at that. “The other thing I remember about him was how respectful he was of people,” Molinar said. “Even as a kid, he was always very kind to people who were older or younger than him. On that trip to Juarez, Molinar recalls, “Fini told me ‘You know uncle, I got a feeling that I won’t make it back.’” I told him not to worry about it. “My sister and her family were living over by the drug store. My brother-in-law always had the greatest magazines to read, so they’d leave the door open, or I’d use my key to get in to read when they weren’t home. I was sitting there one day when outside a car door slammed and I looked out the window. There were two Marine sergeants and I thought, ‘Oh my god.’ They said Fini was hurt pretty bad. I asked if he was going to make it, and one shook his head no. “I had to tell my sister,” he said. 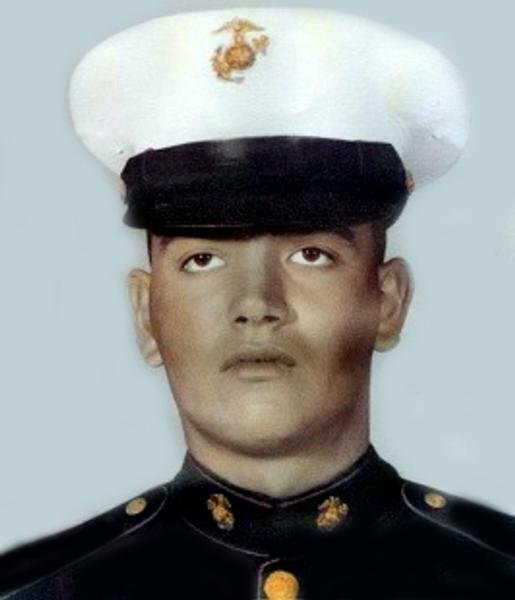 Velásquez, who had just recently been promoted to Lance Corporal, was with his mortar unit April 30, 1968, when a shell exploded during firing. He was burned over more than 90 percent of his body and lingered for nearly a week before he died on May 6. “You know, I remember something else about that time he came home on leave before going to Vietnam,” Molinar said. “We went to Gilcrest to drink some beers, and we saw a kid Fini knew. Man, he was a big kid, six-foot-two, and I don’t know how much he weighed. They called him Bullwinkle. “The kid was getting ready to graduate from high school, and he was saying he was going to join the Marines just like Fini had. Fini tried to talk him out of it. Memories of her brother haunt the pages of Velásquez’s writing. Gloria Velásquez knows her brother will only return in her heartbroken dreams. By starting the scholarship in his memory, she hopes, someone else’s son and brother might have the chance she feels he never got, and maybe not have to bargain their life for the chance to get ahead.